Even if it's still untextured, it is most likely very easy for you to guess which truck this belongs to! We are now in the review stage of geometry submission for this new 3D asset. Already, there are several man-weeks spent on the work; between research and actual 3D model construction. Still some more weeks ahead of us to finalize everything. 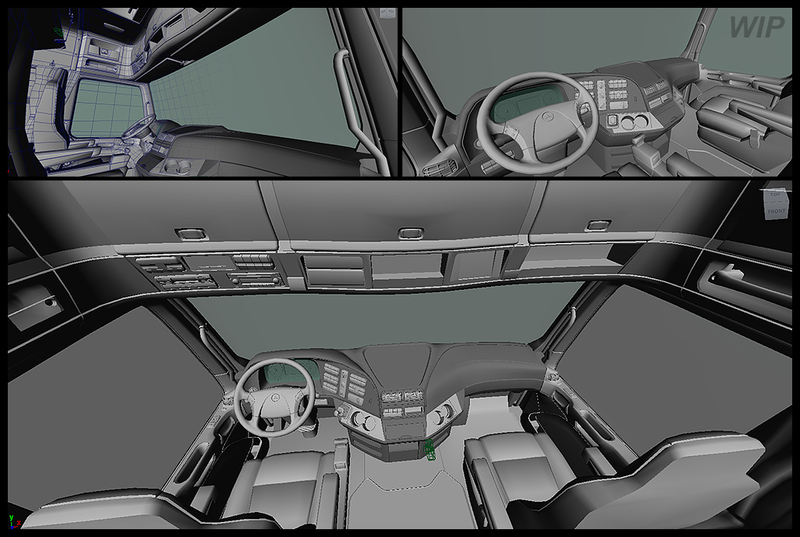 In the end, a truck interior may take up to two solid months of a senior 3D artist's effort to build the model, animate the levers and dials, and texture the cabin. Very good looking model. Please try to change the sounds and add realistic driving time features. Oh wow! This is something amazing! Please SCS, make the retarder for trucks. You see that lever on the right side of the steering column? That's the retarder. So please animate it and make use of it. Please! Keep up the astonishing work SCS. Very detailed!! It's the Actros interior, isn't it? Will you change the sounds in ETS2? Anyway, ETS2=Best game of 2011!!! SCS Software ROCKS! Thanks for posting so often. It is a great treat to open your blog and see so many beautiful and detailed things. Great job!! You seem to be progressing a a phenominal rate!!! The interior looks very real! Congratulations to the geniuses of 3D modeling! absolutely a very good job ! well.. if we are in the topic of the interiors why wouldn't you let us to get ingame much more interior views,why only one? just like in the Rignroll game.. what do you say? FANTASTIC JOB!!! SUPER SUPER MEGA GEIL!!! ETS2-be container port, which can be transported in containers. To forest and dirt road, which can be delivered to the stump. And keep the mine out of the GTS. PLEASE! Ah, when a screen or a magnum renault premium? what about a RHD version for the UK? -Please make the transmission to change gear around 900-1000 RPM And max at 1500 RMP. -Make the trucks accelerate slower (as real ones)and not like F1 cars . -C-B category trucks should get 90 km/h too! Will we see gear sticks and peddals? the 3d art you are showing is good but the engine should equalise the real ones then the game looks more realestic i hope you will do better and all the best to you,great work. Pls scs put this option in wheel on/off option. I don't see the wheel. SCS can you pleace post a video where you play ETS 2, I recement you that you drive a Scania R-serie truck. Like the one you posted th 13 february. How about posting some pictures of those senior and junior 3D artists? It'll be really nice to "meet" you guys! PS. what cad software do you use? nice work, but still to much time on the graphics, show us more about physics(where you guys are poor). Keep up the good work any way. Great. Make a lot of traffic. Accidents near big cityes. And brake for some time! Great job. I hope the trucks in Euro Truck Simulator 2 have more realistic handling then the once in previous games. The Steering wheel is on the wrong side.UK drivers being left out of ETS 2,just like we were with ETS? Nice work! I am sure it will come out good! I have a question: Can you guys make the steering of trucks like Rig N Roll? Make it so that if you have a steering wheel and pedals, if you turn your wheel only a little bit, the truck's wheel only turns a little, not like it does in GTS. But don't worry about the horrible physics of Rig N Roll. You guys had that mastered more than 5 years ago. Why I am saying this is because I just finished playing the game, and I was so dissapointed. That company has nothin on you! SCS, please, make the ability to switch the camera in the cabin for several positions as it is in the game Rig'n'roll - view of passenger location, view from behind the seats, in the form of a sleeping compartment! SCS, please make some tandem trucks like MAN TGX, iveco stralis, and lowdecks, like MAn TGX, DAF XF and lot of others. SCS, please make as many bridges as you can on the highway, a few suspension, a few cable-stayed, a few arch, and a few truss. Also, can you use a similar physics engine to Extreme Trucker 2? Make it so that there are actually bumps on the road, and the truck shows that, by going up and down. No, it is on the correct side, but you Brits drive on the wrong side. But it would be nice to have an opportunity to get a truck with the steering wheel on the right, if the UK will be included in the game. But only if so. There is no need for that if you are going to drive only in the continental Europe. Unless you got an opportunity to buy a Japanese truck from the shop, lmao. Actually, UK drivers got a royal treatment with UK Truck Simulator! Not only have you got the steering wheel on the proper side, but also a whole game focused just on the country. There is no going back, Euro Truck Simulator 2 will include the UK, so we need to give the players a choice of steering wheel position when buying trucks. will cars be able to overtake in single roads? "Unless you got an opportunity to buy a Japanese truck from the shop, lmao." How long has japan been in europe ? Beautiful work guys it is great! NO DRIVING TIME PLEASE ! I want game with fatigure but not as quickly as in ETS1. Second: 0-80 km/h per 3 second is not Truck, please Change please a lot. Differnt surranding, snow, because so it is boredom. I know that change year seasons is a lot of working, ok, but real time, random crash and different surranding be would SUPER on reduction boring (boredom-nudy). Next year Game eg Sweden, etc. You have no ideea how much I can wait for the ETS2. I love it and I am very happy to way that ill we be a great game. Make it the best.